Today’s recipe is taken from my upcoming book Plain & Simple Traditions: Amish & Mennonite Holidays. It is available for pre-order and will be released in December! 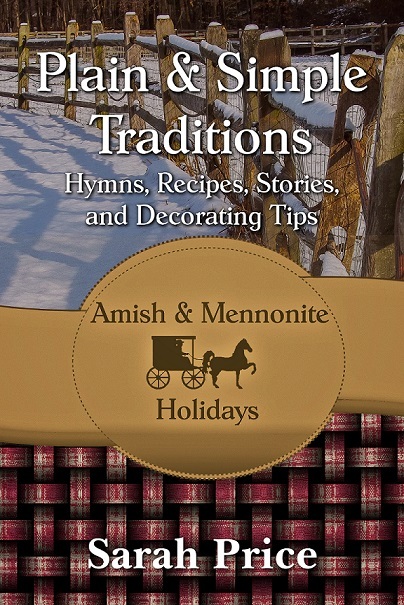 The book contains stories, hymns, decorating tips, and (of course) recipes so that readers can also delight in having a plain and simple holiday, just like the Amish and Mennonites. In a large soup pot, combine the water, ham, dried apples, celery, onions and herbs. Bring to a boil. Reduce the heat to low, cover, and simmer while preparing the dumplings. In a medium-sized bowl, combine the baking mix and milk just until moistened. Uncover the soup pot and carefully drop the batter by heaping tablespoonfuls into the soup pot, making dumplings (8-12 depending on the preferred). Simmer uncovered, for 10 minutes. Cover and simmer until the dumplings are doubled. ⟵Wednesday’s Wanderer: An Interview with Kelly Irvin!